Kiln dusts are fine by-products of Portland cement and lime high-temperature rotary kiln production operations that are captured in the air pollution control dust collection system (e.g., cyclones, electrostatic precipitators, and baghouses). Cement kiln dust (CKD) is a fine powdery material similar in appearance to Portland cement. Fresh cement kiln dusts can be classified as belonging to one of four categories, depending on the kiln process employed and the degree of separation in the dust collection system. (1) There are two types of cement kiln processes: wet-process kilns, which accept feed materials in a slurry form; and dry-process kilns, which accept feed materials in a dry, ground form. In each type of process the dust can be collected in two ways: (1) a portion of the dust can be separated and returned to the kiln from the dust collection system (e.g., cyclone) closest to the kiln, or (2) the total quantity of dust produced can be recycled or discarded. A simplified schematic of a Portland cement manufacturing operation is presented in Figure 1. The chemical and physical characteristics of CKD that is collected for use outside of the cement production facility will depend in great part on the method of dust collection employed at the facility. Free lime can be found in CKD, and its concentration is typically highest in the coarser particles captured closest to the kiln. Finer particles tend to exhibit higher concentrations of sulfates and alkalis. If the coarser particles are not separated out and returned to the kiln, the total dust will be higher in free lime (since it will contain some coarse particles). CKD from wet-process kilns also tends to be lower in calcium content than dust from dry-process kilns. Lime kiln dust (LKD) is physically similar to cement kiln dust, but chemically quite different. LKD can vary chemically depending on whether high-calcium lime (chemical lime, hydrated lime, quicklime) or dolomitic lime is being manufactured. Fresh LKD can be divided into two categories based on relative reactivity, which is directly related to free lime and free magnesia content. Free lime and magnesia content are most dependent on whether the feedstock employed is calcitic or dolomitic limestone. LKD with a high free lime content IS highly reactive, producing an exothermic reaction upon addition of water. This "quick" LKD is of greatest commercial interest as a direct replacement or substitute for hydrated lime. Figure 1. Portland cement manufacturing operations. In addition to fresh CKD and LKD production, it is estimated that the total amount of kiln dust currently stockpiled throughout the country exceeds close to 90 million metric tons (100 million tons). These stockpiles are usually located relatively close to the cement and lime manufacturing plants, and vary in age and composition, with exposure to the elements (moisture in particular) reducing the chemical reactivity of the dusts. Most of the CKD produced is reused within the cement plant. About 64 percent of the total CKD generated (or about 8.3 million metric tons) is used in this fashion. (2) Approximately 6 percent of the total CKD generated is utilized off-site. The most common beneficial use of CKD is its use as a stabilizing agent for wastes, where its absorptive capacity and alkaline properties can reduce the moisture content, increase the bearing capacity, and provide an alkaline environment for waste materials. Both cement and lime kiln dusts have been used as stabilizing and solidifying agents in the treatment of soft or wet soils for engineering purposes(4)and for environmental remediation. (5) Both dusts have also been used as pozzolan initiators,(6) as a pelletized lightweight aggregate material, as a mineral filler in asphalt pavements, and as a fill material in earth embankments. A significant potential market for CKD and LKD exists for its use as a soil conditioner for agricultural purposes (in lieu of agricultural lime) and as an acid-neutralizing agent in agricultural and water treatment applications. However, at the present time, the EPA is evaluating the possible need to regulate the use of CKD in this application. In recent years hazardous waste has been used as a fuel in cement kiln operations. The use of waste materials in cement kiln operations has raised concerns regarding the accumulation of heavy metals (e.g., lead, cadmium, and chromium) in CKD generated by plants that use these alternative materials. (2) In addition, runoff and precipitation that contact CKD storage piles have exhibited pH levels above 12.5, which can be highly corrosive. (7)The EPA has expressed concern over uncontrolled transport, storage, and disposal of large volumes of CKD (in uncovered and unlined piles), which are easily removed by wind and eroded by water. In a recent regulatory determination, the EPA committed to the development of revised standards for managing CKD. (7) In this regulatory determination, EPA stated, with respect to beneficial uses, that "for most off-site uses (e.g., waste stabilization or certain construction uses) EPA's current record indicates that there are no significant risks." This would not preclude the need to examine the chemical quality of CKD prior to its use. Kiln dusts may be obtained directly from Portland cement or hydrated lime producers. Waste management firms retained by the manufacturers may also supply cement and lime kiln dusts. The specific characteristics of the CKD and LKD vary from plant to plant depending on the feedstock employed at the cement or lime production plant, the major products being manufactured, kiln design and operation, fuel type, and the type of dust control/collection systems employed. The primary value of cement and lime kiln dusts is their cementitious properties. Depending on the concentration of hydratable oxides present in the CKD and LKD, primarily unreacted or free lime (CaO) and free magnesia (MgO) respectively, cement kiln dust and lime kiln dust can be highly cementitious. Fresh CKD and LKD are generally difficult to handle in bulk because of their fine, dry, powdery nature and caustic characteristics. The addition of water to mitigate blowing and dusting problems during transport is common, but this practice causes premature hydration of the free lime or magnesia and significantly reduces the cementitious potential of the CKD or LKD. Where the CKD or LKD must be kept dry to preserve its cementitious potential, it must be handled in a fashion that is similar to conventional cement or lime (pneumatically loaded into and unloaded from cement tanker trucks and stored in silos). The processing of stockpiled CKD and LKD can be difficult. Typically, very large, above- ground stockpiles or backfilled quarries (source of raw product for cement manufacture) are involved, representing many years of cement or lime production. The surface of the stockpile or fill site usually crusts over and becomes hard, while the interior of the stockpile can stay relatively loose and can contain some unhydrated material even after many years if exposure to moisture is limited. 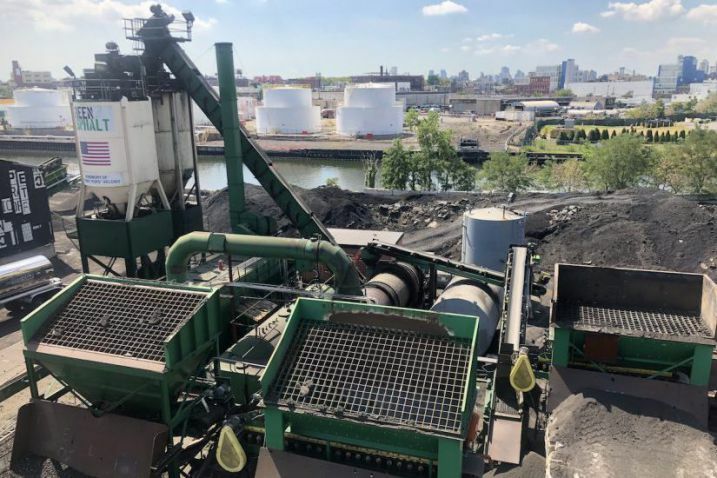 Processing of hardened stockpiled kiln dusts requires crushing and screening equipment to remove oversize pieces as well as any litter or garbage (wood, etc.) that may have become mixed with the kiln dusts. CKD and LKD have been used as mineral filler in asphalt concrete mixes. The blending of CKD into the asphalt cement binder prior to incorporation with the hot mix aggregate results in a binder (mastic) that can significant-ly reduce asphalt cement requirements (between 15 and 25 percent by volume). (8) Further, the lime components of the CKD and LKD can assist in promoting stripping resistance (preventing moisture-related damage resulting from the separation of the asphalt cement film from the aggregate at its interface in the presence of moisture that is most common in siliceous aggregates). In this application, these dusts can be used to replace hydrated lime or liquid antistripping agents. CKD and LKD can also be agglomerated or pelletized to produce an artificial aggregate for special applications. In Japan an oil-absorbing artificial aggregate is reportedly manufactured using CKD that is used to improve the rutting resistance of asphalt concrete pavements by absorbing the lighter fractions of excess asphalt cement binder during hot weather. CKD can be used as a cementitious material or a pozzolan activator in stabilized base or flowable fill applications. LKD has potential for use as a pozzolan activator in each respective application. As a cementitious material, CKD can replace or be used in combination with Portland cement. As a pozzolan activator, both CKD and LKD can replace or be used in combination with Portland cement or hydrated lime. CKD and LKD are fine, powdery materials of relatively uniform size. Table 1 lists some typical physical properties of both cement and lime kiln dusts. Chemically, CKD has a composition similar to conventional Portland cement. The principal constituents are compounds of lime, iron, silica and alumina. Table 2 lists typical compositions for fresh and stockpiled CKD and LKD. The free lime content of LKD can be significantly higher than that of CKD (up to about 40 percent), with calcium and magnesium carbonates as the principal mineral constituents. The pH of CKD and LKD water mixtures is typically about 12. Both materials contain significant alkalis, and consequently are considered to be caustic. Due to the caustic nature of CKD and LKD, some corrosion of metals (e.g., aluminum) that come in direct contact with CKD and LKD may occur. * Two types of lime kiln dust were classified in the reported data (high reactivity and low reactivity) on the basis of the release of heat and rise in temperature when placed in solution. Collins, R. J. and J. J. Emery. Kiln Dust-Fly Ash Systems for Highway Bases and Subbases. Federal Highway Administration, Report No. FHWA/RD-82/167, Washington, DC, September, 1983. U.S. Environmental Protection Agency. Report to Congress on Cement Kiln Dust. EPA 530-R-94-001, December, 1993. Davis, T.A. and D. B. Hooks. Study of the State of the Art of Disposal and Utilization of Waste Kiln Dust from the Cement Industry, Report of the U.S. EPA, Grant No. R-801872, Southern Research Institute, Birmingham, Alabama, 1974. MacKay, M. H. and J. J. Emery. "Stabilization/Solidification of Contaminated Soils and Sludges Using Cementitious Systems: Selected Case Histories," Transportation Research Record No. 14, Transportation Research Board, Washington, DC, 1994. "Cement Kiln Dust: Where Is It Going?," Pit & Quarry, July, 1983. Regulatory Determination on Cement Kiln Dust. Final Rule 60 FR 7375, February 7, 1995. Kraszewski, L. and J. Emery. "Use of Cement Kiln Dust as a Filler in Asphalt Mixes," Proceedings, ORF/CANMET Symposium on Mineral Fillers, Ontario Research Foundation and Canada Centre for Mineral and Energy Technology, Toronto, Canada, 1981. Emery, J. J. "Potential Uses for Kiln Dusts," Symposium on Mineral Fillers, Ontario Research Foundation, ORF/CANMET, Toronto, October 1981. FHWA. Stone Mastic Asphalt - SMA - Technology Synopsis and Work Plan, Draft, Federal Highway Administration, Washington, February 1991. AASHTO. 1990 European Asphalt Study Tour, American Association of State Highway and Transportation Officials, Washington, June 1991. Carrick, J., Macinnis, K., Davidson. K., Schenh, W., and Emery, J. J. "Development of Stone Mastic Asphalt Mixes for Ontario," Canadian Technical Asphalt Association Proceedings - 36th Annual Conference, Vol. XXXVI, Montreal, Quebec, November 1991. ASTM C204. "Standard Test Method for Fineness of Portland Cement by Air Permeability Apparatus," American Society for Testing and Materials, Annual Book of ASTM Standards. Volume 04.01, West Conshohocken, Pennsylvania, 1994. Neville, A. M. Properties of Concrete, Fourth Edition, John Wiley & Sons, Inc., New York, 1996. Todres, H. A., A. Mishulovich, and J. Ahmed. Cement Kiln Dust Management: Permeability. PCA Research and Development Bulletin RD103T, Portland Cement Association, Skokie, Illinois, 1992. Both fresh cement kiln dust (CKD) and lime kiln dust (LKD) can be used as mineral filler in hot mix asphalt paving. (1) The use of low addition levels of both fresh CKD and LKD as mineral filler in hot mix asphalt surface course mixes (approximately 5 percent by weight of aggregate) reportedly exhibit mix properties comparable to that of natural filler such as hydrated lime and stone dust. Gradation, organic impurities, and plasticity requirements normally associated with mineral filler specification requirements can usually be met without difficulty. The specification requirements for mineral fillers (AASHTO M17),(5) are shown in Table 3. The grading requirements for mineral fillers are such that CKD can, with minimal screening, readily comply with the specification requirements. Some LKD can be somewhat coarse, which will necessitate screening to remove oversize particles. Table 3. AASHTO M17 specification requirements for mineral filler for use in bituminous paving mixtures. Because only fresh, dry kiln dust should be used, the CKD and LKD must be stored in silos or cement trucks. When stored for extended periods in silos, kiln dusts may have a tendency to clump or bridge together at the silo feed opening, due to their fine nature. Consequently, bins or silos should be equipped with suitable vibration devices at the feed opening to mitigate this potential problem. Some of the properties of kiln dust that are of particular interest when kiln dust is used as a mineral filler in asphalt paving applications include particle size and specific gravity. Particle Size: The maximum particle size of most kiln dusts is about 0.3 mm (No. 50 sieve), which conforms to mineral filler top size requirements outlined in AASHTO M17. Commercial kiln dusts are highly angular. The Blaine fineness(6) ranges from about 4600 (coarser) cm2/g to 14000 (finer) cm2/g. (7) LKD is generally somewhat more coarse than cement kiln dusts, having a top size of about 2 mm (No. 10 sieve) and Blaine fineness ranging between about 1300 and 10000 cm2/g. Some of the properties of the asphalt mix that are of interest when kiln dusts are used as a mineral filler are mix durability and binder properties. 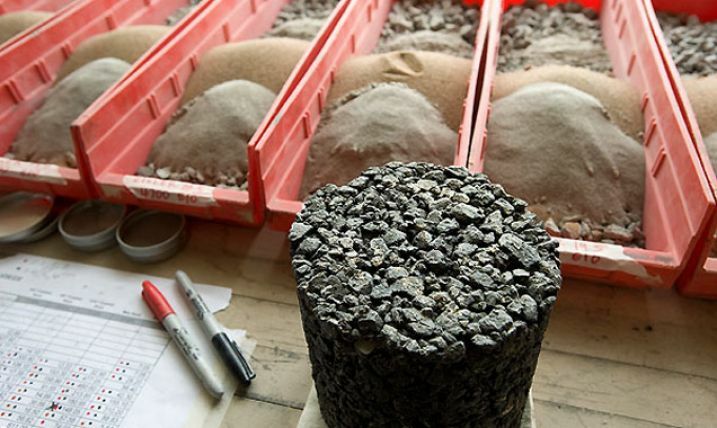 Conventional AASHTO pavement structural design methods are appropriate for asphalt concrete incorporating kiln dust as mineral filler. There are no additional or special construction procedures involved for the use of CKD or LKD beyond those required for conventional mineral fillers. Kiln dusts for use as mineral filler can be precoated with asphalt emulsion (approximately 10 percent by mass) to facilitate handling and transportation. The emulsion value is largely recovered when incorporated in hot mix asphalt, but the cost nevertheless increases without apparent improvement in mix properties. The same methods and equipment used for conventional pavements are applicable to asphalt pavements containing kiln dusts. Some kiln dust sources have been used successfully as mineral filler in asphalt paving applications; however, there are adequate data on the different properties of specific sources of kiln dust and its economic viability for use as a mineral filler. The addition of larger quantities of kiln dust to the binder (stone mastic asphalt) and its properties should be investigated to assess its potential for use in special applications. The effectiveness CKD and LKD as antistripping agents should be evaluated at different rates of addition. The environmental properties of CKD and LKD should be better defined and management practices delineated to ensure that CKD and LKD are managed in an environmentally acceptable manner. Kraszewski, L., and Emery, J. J. "Use of Cement Kiln Dust as a Filler in Asphalt Mixes," Symposium on Mineral Fillers, Ontario Research Foundation, ORF/CANMET, Toronto, October, 1981. Parsons, T. Kiln-Dust-Antistripping Additives for Asphaltic Concrete Mixtures, Report, Newfoundland Department of Works, Services and Transportation, Materials Engineering Division, 1995. Transportation Association of Canada. Moisture Damage of Asphalt Pavements and Antistripping Additives, Report Prepared by John Emery Geotechnical Engineering Limited for Transportation Association of Canada, Ottawa, September, 1996. Ciesielski, S. K. and R. J. Collins. Recycling and Use of Waste Materials and By-Products in Highway Construction," National Cooperative Highway Research Program Synthesis of Highway Practice 199, Transportation Research Board, Washington, DC, 1994. American Association of State Highway and Transportation Officials. Standard Method of Test, "Mineral Filler for Bituminous Paving Mixtures," AASHTO Designation: M17-83, Part I Specifications, 14th Edition, 1986. American Association of State Highway and Transportation Officials. Standard Method of Test, "Fineness of Portland Cement by Air Permeability Apparatus," AASHTO Designation: T153-86, Part II Tests, 14th Edition, 1986. Collins, R. J. and J. J. Emery. Kiln Dust-Fly Ash Systems for Highway Bases and Subbases, FHWA/RD-82/167, Federal Highway Administration, Washington, DC, September, 1983. Emery, J. J. "Potential Uses for Kiln Dusts," Symposium on Mineral Fillers, Ontario Research Foundation, ORF/CANMET, Toronto, October, 1981. Puzinauskas, V. P. Filler in Asphalt Mixtures, Research Report 69-2, The Asphalt Institute, College Park, Maryland, February, 1969. American Society for Testing and Materials. Standard Specification D2726-96, "Bulk Specific Gravity and Density of non-Absorptive Compacted Bituminous Mixtures," Annual Book of ASTM Standards, Volume 04.03, West Conshohocken, Pennsylvania, 1996. American Society for Testing and Materials. Standard Specification D2950-96, "Density of Bituminous Concrete in Place by Nuclear Methods,"Annual Book of ASTM Standards, Volume 04.03, West Conshohocken, Pennsylvania, 1996. Both cement kiln dust (CKD) and lime kiln dust (LKD) can be used as activators in pozzolanic stabilized base mixtures. Depending on its reactivity, CKD may have potential for use as the sole cementitious material in stabilized base mixtures. Most work with kiln dusts, however, has involved combinations of kiln dusts and coal fly ash as the cementitious component of the mixture. The strength of kiln dust-fly ash-aggregate base and subbase materials is dependent on three factors: the kiln dust, the coal fly ash, and the aggregate. Either pozzolanic or self-cementing fly ash can be used as part of stabilized base (PSB) mixtures, although precautions may be necessary when using a self-cementing fly ash. With self-cementing fly ashes, no activators are needed. There is no widespread commercial use of kiln dusts in stabilized base mixtures in the United States today. Only four states are reported to have research data on the use of CKD for stabilized base. (1) Research conducted in Kentucky found that LKD performed better in stabilized base applications than CKD. (2) Trial LKD sections constructed in Ohio and tested over a period of 6 months exhibited no cracking or surface damage, and deflections were observed to decrease with time as the pavement cured. In the Ohio project, six test sections were constructed in November 1997 as part of a research study by the University of Toledo. The fly ash/CKD/Portland cement blends (percent by mass dry ingredients) utilized in this study were: 6/6/0, 8/8/0, 10/10/0, 12/12/0, 8/8/0.5, and 8/8/1. The total traffic during this period was 25,820 equivalent 8,165 kg (18,000 lb) single-axle loads. CKD sections were reported to exhibit dimensional (volumetric) stability problems, which were attributed to the presence of sulfates and alkalis in the dust. If fresh kiln dust is being used, it must be stored in enclosed bins or silos to keep out moisture and prevent dusting. CKD and LKD can also be used with fly ash, provided the dust is conditioned with moderate amounts of water. The use of moisture-conditioned kiln dust (to suppress dusting) and fly ash allows greater quantities of both materials to be set aside for future use without the need for enclosed storage. Such moisture conditioning will, however, cause full or partial hydration of the available free lime in the dust that may necessitate the later addition of a commercial hydrated lime to improve early strength development. The properties of kiln dusts that are of particular interest when kiln dusts are used in stabilized base applications are particle size and specific gravity. Particle Size: Maximum particle size of most kiln dusts is about 0.3 mm. According to AASHTO T153-86(4) the Blaine fineness ranges from about 4600 (coarser) to 14000 (finer) cm2/g. (3) LKD is generally somewhat more coarse than CKD, having a top size of about 2 mm (No. 10 sieve) and Blaine fineness ranging between about 1300 and 10000 cm2/g. Kiln dusts have been used, primarily as a pozzolanic activator, in kiln dust-fly ash-aggregate base mixtures. Some of the properties of these mixtures that are of interest include strength, durability, volume stability, and autogenous healing properties. These properties are dependent on the properties of the three major components: the kiln dust, the fly ash, and the aggregate. Strength: Kiln dust-fly ash stabilized base mixtures containing dolomitic limestone aggregates generally exhibit higher densities and compressive strengths than siliceous aggregate blends. Similarly, the strength of the mixtures will be somewhat dependent upon the aggregate shape (higher strength with angular crushed aggregates). The effect of fly ash on strength development of kiln dust-fly ash-aggregate mixes depends on the type of fly ash used in the mix. Table 4 lists typical 7-day compressive strength results that were achieved for kiln dust-fly ash-aggregate mixes. (3) Mixes employing self-cementing fly ash tend to have higher 7-day strengths than those with pozzolanic fly ash. Table 4. Compressive strength of Kiln dust-fly ash-aggregate mixes. Table 5. Splitting tensile strength and resilient modulus of Kiln dusts-fly ash-aggregate mixes. Durability: The durability of kiln dust-fly ash-aggregate mixtures assessed using the AASHTO T136(5) procedure tends to be very good, with freeze-thaw losses of 2 percent or less measured. (3) This compares favorably with conventional lime-fly ash-aggregate mixes. Chemical Composition: CKD has lower free lime content (approximately 4.4 percent) compared to LKD which can be as high as 40 percent. (6) The pH of water in contact with CKD and LKD mixtures is typically about 12. Due to its relatively high pH, some corrosion of metals (e.g., aluminum) in direct contact with CKD and LKD may occur. Test specimens should be prepared in accordance with ASTM C593(10). A seven-day compressive strength of 2760 kPa (400 lb/in2) is considered to be the minimum value for acceptance of the kiln dust with Class F fly ash and 4140 kPa (600 lb/in2) if Class C fly ash is used. It is important to maintain a condition of excess moisture for highly reactive LKD and CKD to permit complete hydration of any free lime. A separate slaking test can be completed in advance to estimate the range of slaking water required. After determining the optimum moisture content for molding, specimens should be prepared and tested for compressive strength, durability (vacuum saturation method as per ASTM C593(10) and freeze-thaw test in accordance with AASHTO T136,(5)) and volume stability (autoclave expansion test (AASHTO T107)(11) or mortar bar expansion test (AASHTO M210). (12) At least three kiln dust-fly ash proportions should be tested in compression to determine the optimal mix for durability and volume stability testing. High-strength mixes may not require durability testing. Structural design procedures for stabilized base containing kiln dusts are the same as design procedures for conventional stabilized base materials. Fresh CKD and LKD are generally difficult to handle in bulk because of their fine, dry powdery nature and caustic characteristics. The addition of water to mitigate blowing and dusting problems during transport is common, but this practice causes hydration of the free lime or magnesia and significantly reduces the cementitious potential of the CKD or LKD. Where the CKD or LKD must be kept dry to preserve its cementitious potential, it must be handled in a similar fashion to conventional cement or lime - pneumatically loaded and unloaded from cement tanker trucks and stored in silos. Kiln dust-fly ash mixtures produced using self-cementing fly ash must handled somewhat differently than mixes with pozzolanic fly ash because self-cementing fly ash mixtures (especially those high in free lime) set up much more rapidly when exposed to water. Due to the fine nature of kiln dusts, they may have a tendency to clump or bridge together at the feed opening when stored in silos. Consequently, bins or silos should be equipped with suitable vibration devices at the feed opening to mitigate this problem. Kiln dust-fly ash-aggregate mixtures are mixed and placed in uniform lifts and compacted using conventional construction equipment. The mixtures must be placed and compacted continuously and cannot be stockpiled for more than a couple of hours, after which time they will set. There is a need for additional research to assess the suitability of using LKD and particularly CKD as a pozzolan activator in stabilized base applications. Specifications are required to define both the physical and chemical requirements needed to ensure acceptable field performance. Miller, C. T., D. G. Bensch, and D. C. Colony. "Use of Cement-Kiln Dust and Fly Ash on Pozzolanic Concrete Base Courses," Transportation Research Record No. 754, Transportation Research Board, Washington, DC, 1980. American Association of State Highway and Transportation Officials, Standard Method of Test, "Freezing-and-Thawing Tests of Compacted Soil-Cement Mixtures," AASHTO Designation: T136-76 (1986), Part II Tests, 14th Edition, 1986. Boles, W. F. Fly Ash Facts for Highway Engineers, FHWA-DP-59-8, Federal Highway Administration, Washington, DC, July, 1986. American Association of State Highway and Transportation Officials. Standard Method of Test, "Moisture-Density Relations of Soil-Cement Mixtures," AASHTO Designation: T134-76 (1986), Part II Tests, 14th Edition, 1986. American Association of State Highway and Transportation Officials. Standard Method of Test, "Wetting-and-Drying Test of Compacted Soil-Cement Mixtures," AASHTO Designation T135-76, Part II Tests, 14th Edition, 1986. American Society for Testing and Materials. Standard Specification C593, "Fly Ash and Other Pozzolans for Use with Lime," Annual Book of ASTM Standards, Volume 04.01, ASTM, West Conshohocken, Pennsylvania, 1994. American Association of State Highway and Transportation Officials. Standard Method of Test, "Autoclave Expansion of Portland Cement," AASHTO Designation: T107-86, Part II Tests, 14th Edition, 1986. American Association of State Highway and Transportation Officials. Standard Specification for Materials, "Use of Apparatus for Use in Measurement of Length Change of Hardened Cement Paste, Mortar, and Concrete," AASHTO Designation: M210-85, Part I Specifications, 14th Edition, 1986.